Cook the sausage in 2 tablespoons of olive oil in a large skillet over medium heat and covered with the lid until thoroughly cooked, approximately 8-10 minutes. Remove the sausage from the skillet, slice, and set aside. In a large bowl, season sliced chicken breasts with salt, pepper, 1 teaspoon of parsley flakes, ½ teaspoon of paprika and ½ teaspoon of garlic powder. In the same skillet used to cook the sausage, sauté the chicken in the oil from the sausage for about 10 minutes. After the chicken is cooked, remove it from the skillet and set aside with the sausage. In the same skillet, add 1 tablespoon of olive oil, potatoes, peppers and onions. Sauté until lightly browned. Add chicken stock and cook until tender, about 15 minutes. 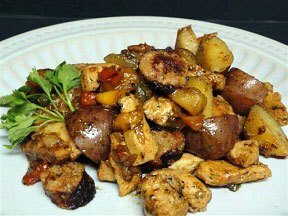 Add the sausage and chicken into skillet and cook for an additional 10 minutes.